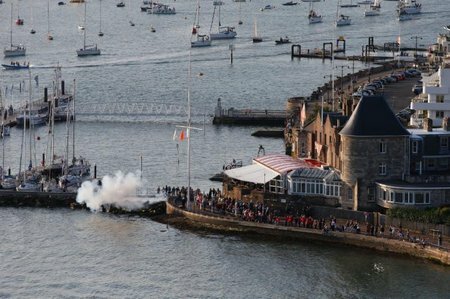 The overwhelming majority of the 1,584-strong fleet has finished the 2015 J.P. Morgan Asset Management Round the Island Race, organised by the Island Sailing Club, after a day of racing in sparkling conditions. Giovanni Belgrano’s 38ft classic yacht Whooper has been revealed as provisional winner of the main prize, the Gold Roman Bowl. In the ISC Rating System fleet, Jeremy Vines’ Dufour 34 Pickle has been provisionally announced as overall winner among the 680 entries. William Ball’s Grand Soleil 34.3 Gazelle is second, while one of the lowest-rated boats in the race, Brain Haugh’s 1958 East Anglian 28 Cherete third, just three seconds behind Gazelle on corrected time. The stream of finishers has now slowed to a trickle, with the remaining boats scattered through the eastern Solent having until the time limit at 2200 to finish. Full results are posted at http://www.rtir.me/results and the prizegiving hosted by the Island Sailing Club, with trophies presented by Paralympic gold medallist Helena Lucas MBE, will be held at 1200 noon tomorrow Sunday June 28. 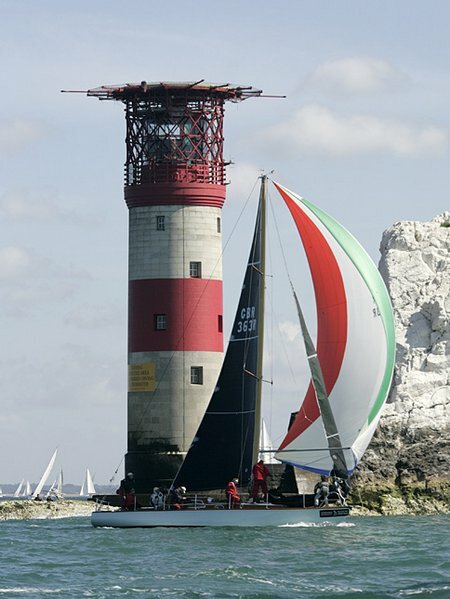 Next year’s J.P. Morgan Asset Management Round the Island Race will take place on July 2, 2016. 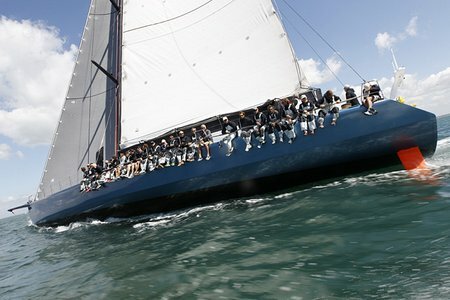 The magnificent sight of the MOD70 Concise 10, who took today’s line honours. The MOD70 trimaran Concise 10 took line honours, finishing at 1040, with an elapsed time of three hours, 30 minutes and 24 seconds. This puts her 38 minutes outside the multihull race record set by Sir Ben Ainslie in 2013. The four GC32 foiling catamarans crossed the line just after 1100, led by Sultanate of Oman and Alinghi, after a close race that saw the boats separated by less than six minutes at the finish. Mike Slade’s 100ft Leopard finished at 1140 to take monohull line honours, but was outside the record time he set two years ago. Provisional results show Sir Keith Mills’ Ker 40 Invictus as winner of IRC Group 0, with Tony Langley’s TP52 Gladiator second and Steward Whitehead and Jeff Blue’s Carkeek 40 Rebellion third. 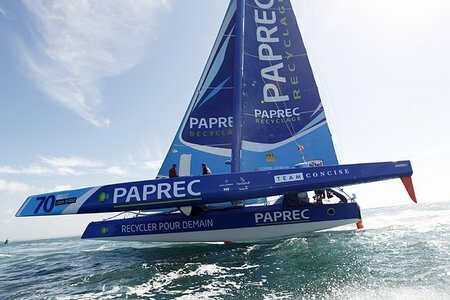 A French boat, Arnaud Delemare and Eric Mordret’s JPK 1080 is winner of IRC Group 1, while another boat from the same manufacturer, David Franks’ JPK 1010 Strait Dealer heads Group 2 on corrected time. In the ISC Rating System divisions, Johnny Plumbe’s Emelina is provisionally winner of Group 4. Group 5 is led by Jeremy Vines’ Pickle, followed by C and M Telford’s Manic and Paul Britton’s Florence. In Group 6, Demian Smith’s Way Beyond is provisionally first, while William Ball’s Gazelle heads Group 7.